Heraclitus and I made the current issue of BusinessWeek. BusinessWeek had a recent article on the the growing acceptance by the business community of the wisdom of the Bhagavad Gita, the ancient book of Indian spiritual teachings. I sent them my comments about this subject, and they ran them as the lead letter in their magazine (you can see it HERE in the digital version). 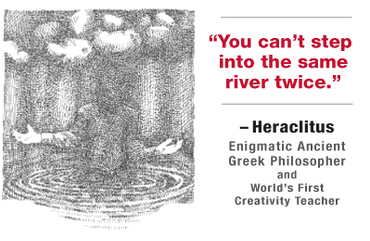 In honor of this occasion, let's crack open another of Heraclitus' enigmatic epigrams. Today's is one of his most famous: "You can't step into the same river twice." I believe there's a creative strategy in this insight: "Escape from obsolete ideas." Follow along, and see if this applies to anything you are currently doing. Like a river, the world is constantly changing. New laws are enacted and others are no longer enforced. New styles of behavior and expression become fashionable and others are relegated to the dust-heap. Thus, the strategies we employ need to be appropriate to the problems and opportunities before us. For example, it's said that the Prussian King Frederick the Great (1712-1786) lost the Battle of Jena even though it was fought in 1806. This means that for twenty years after his death, the Prussian army perpetuated his successful organization instead of adapting to meet the changes in the art of war. Had his generals questioned Frederick's military tenets, they might have fared better against Napoleon. Remember: every right idea is eventually the wrong idea. Innovation means not only generating new ideas, but escaping from obsolete ones as well. As you think about a current problem or issue, you might ask yourself these questions: "What assumptions should I update? What is no longer true and should be discarded? What's now possible?" Working at a Web2.0 company, I have to say that I think this idea can be over applied. It can feel like we are often changing just for the sake of changing, or changing because that is what someone else did and we need to stay current. But I think it is important to recognize the reasons we made a decision in the first place and judge whether they still apply to the situation. It is true that you don't want to get stuck with an idea or product because you refuse to reevaluate it, but the other extreme can be just as detrimental. If things don't seem to be going well, many have tendency to immediately change course. I think it makes more sense to take a look at why things are not working to see what extra information you now have about a situation and what you can do with that. Or whether you simply don't have enough information to make a good choice yet and need to spend some time gathering that before chucking the old idea out. I too like 'Every right idea is eventually the wrong idea' but, I think it is important to keep in mind that 'eventually' does not always mean the next day. I think this vision can be extended to : "escape from obsolete paths or schemes". It is often quite comfortable to keep the same routines rolling. Just like escaping from obsolete ideas, I think it is good to reevaluate our processes. Changing the way we work (or "see" our work) quite often leads to innovation opportunities. "Once the first shot is fired in War, the plan goes out the window"
It's an exaggeration of course, but similar to your post it stresses the importance of adaptation. A sound strategy is always good to have, but life doesn't always work out as planned. We all have to adapt or risk becoming obsolete. I love the line 'Every right idea is eventually the wrong idea'.